a. ^ Full name in the Serbo-Croatian and Macedonian languages, written in the Latin alphabet (see Name section for details). b. ^ Full name in Serbo-Croatian and Macedonian, written in Cyrillic. c. ^ Full name in the Slovene language (Slovene only uses Latin). d. ^ There was no proclaimed official language at federal level. e. ^ Serbo-Croatian was a de facto official language. Its regional varieties were recognized and made official in their respective republics: as Serbian in SR Serbia, Croatian in SR Croatia and Bosnian, Serbian and Croatian in SR Bosnia and Herzegovina. f. ^ Official in SR Macedonia. g. ^ Official in SR Slovenia. The Socialist Federal Republic of Yugoslavia (SFR Yugoslavia or SFRY) was the Yugoslav state that existed from its foundation in the aftermath of World War II until its dissolution in 1992 amid the Yugoslav Wars. It was a socialist state and a federation made up of six socialist republics: Slovenia, Croatia, Bosnia and Herzegovina, Serbia, Montenegro and Macedonia. 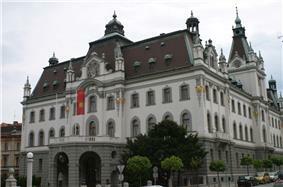 In addition, it included two autonomous provinces within Serbia: Kosovo and Vojvodina. After initially siding with the Eastern bloc under the leadership of Josip Broz Tito at the beginning of the Cold War, Yugoslavia pursued a policy of neutrality after the Tito–Stalin split of 1948, and it became one of the founding members of the Non-Aligned Movement. After the death of Tito in 1980, rising ethnic nationalism in the late 1980s led to dissidence among the multiple ethnicities within the constituent republics, followed by collapse of inter-republic talks on transformation of the country and recognition of their independence by some European states in 1991. 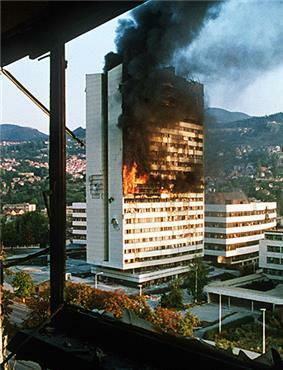 This led to the country collapsing along the federal units, followed by the final downfall and breakup of the country in 1992, and the start of the Yugoslav Wars. The name Yugoslavia, an Anglicised transcription of Jugoslavija, is a composite word made-up of jug (with the "j" pronounced like an English "y") and slavija. The translation of the Macedonian, Serbo-Croatian and Slovene word jug is "south", while slavija ("Slavia") keeps its meaning ("land of the Slavs"). Thus, a "translation" of Jugoslavija would be "South-Slavia" or "Land of the South Slavs". The term unifies the six South Slavic nations of Yugoslavia: Croats, Macedonians, Montenegrins, Bosniaks, Serbs and Slovenes. The full official name of the country varied significantly between 1945 and 1992. Yugoslavia was formed in 1918 under the name Kingdom of Serbs, Croats and Slovenes. In January 1929, King Alexander I assumed dictatorship of the country and renamed it into Kingdom of Yugoslavia, for the first time making the term "Yugoslavia"—which had been used colloquially for decades (even before the country was formed)—the official name of the state. After the Kingdom was occupied during World War II, AVNOJ announced in 1943 their intention to rebuild the country as Democratic Federal Yugoslavia (DF Yugoslavia, DFY), leaving the republic-or-kingdom dilemma open. Latin alphabet: Socijalistička Federativna Republika Jugoslavija. Cyrillic script: Социјалистичка Федеративна Република Југославија. Socialistična federativna republika Jugoslavija, pronounced . Due to the length of the name, abbreviations were often used to refer to the Socialist Federal Republic of Yugoslavia, though the state was most commonly known simply as Yugoslavia. The most common abbreviation is SFRY (SFRJ or СФРЈ), though SFR Yugoslavia was also used in official capacity, particularly by the media. On 6 April 1941, Yugoslavia was invaded by the Axis powers led by Nazi Germany; by 17 April 1941, the country was fully occupied and was soon carved up by the Axis. Yugoslav resistance was soon established in two forms, the Royal Yugoslav Army and the People's Liberation Army and Partisan Detachments of Yugoslavia, known simply as the Partisans. The Partisan supreme commander was Josip Broz Tito (head of the KPJ), and under his command the movement soon began establishing "liberated territories" which attracted the attentions of the occupying forces. The Front formed a representative political body, the Anti-Fascist Council for the People's Liberation of Yugoslavia (AVNOJ, Antifašističko Vijeće Narodnog Oslobođenja Jugoslavije). The AVNOJ, which met for the first time in Partisan-liberated Bihać on 26 November 1942 (First Session of the AVNOJ), claimed the status of Yugoslavia's deliberative assembly (parliament). During 1943, the Yugoslav Partisans began attracting serious attention from the Germans. In two major operations of Fall Weiss (January to April 1943) and Fall Schwartz (15 May to 16 June 1943), the Axis attempted to stamp-out the Yugoslav resistance once and for all. The battles, which were soon to be known as the Battle of the Neretva and the Battle of the Sutjeska respectively, saw the 20,000-strong Partisan Main Operational Group engaged by a force of around 150,000 combined Axis troops. On both occasions, despite heavy casualties the Partisan commander Josip Broz Tito succeeded in evading the trap and retreating to safety. Following the withdrawal of the main Axis forces, the Partisans emerged stronger than before and occupied a more significant portion of Yugoslavia. The events greatly increased the standing of the Partisans, and granted them a favorable reputation among the Yugoslav populace – leading to increased recruitment. On 8 September 1943, Fascist Italy capitulated to the Allied powers, leaving their occupation zone in Yugoslavia open to the Partisans. Tito took advantage of the events by briefly liberating the Dalmatian shore and its cities. This granted the Partisans Italian weaponry and supplies, volunteers from the cities previously annexed by Italy, and Italian recruits crossing over to the Allies (the Garibaldi Division). After the highly favorable chain of events, the AVNOJ decided to meet for the second time – now in Partisan-liberated Jajce. The Second Session of the AVNOJ lasted from 21 to 29 November 1943 (right before and during the Tehran Conference), and came to a number of significant conclusions. The most significant of these was the establishment of the Democratic Federal Yugoslavia, a state that would be a federation of six equal South Slavic republics (as opposed to the Serbian predominance in pre-war Yugoslavia). The council decided on a "neutral" name and deliberately left the question of "monarchy vs. republic" open, ruling that Peter II would only be allowed to return from exile in London upon a favorable result of a pan-Yugoslav referendum on the question. Among other decisions, the AVNOJ decided on forming a provisional executive body, the National Committee for the Liberation of Yugoslavia (NKOJ, Nacionalni komitet oslobođenja Jugoslavije), appointing Josip Broz Tito the Prime Minister. Having achieved success in the 1943 engagements, Tito was also granted the rank of Marshal of Yugoslavia. Favorable news also came from the Tehran Conference taking place at almost the same time in Iran, the Allied powers concluded that the Partisans would be recognized as the Allied Yugoslav resistance movement and granted supplies and wartime support against the Axis occupation. The DFY's legislature, after November 1944, was the Provisional Assembly. The Tito-Šubašić agreement of 1944 declared that the state was a pluralist democracy that guaranteed: democratic liberties; personal freedom; freedom of speech, assembly, and religion; and a free press. However, by January 1945 Tito had shifted the emphasis of his government away from emphasis on pluralist democracy, claiming that though he accepted democracy, he claimed there was no "need" for multiple parties, as he claimed that multiple parties were unnecessarily divisive in the midst of Yugoslavia's war effort and that the People's Front represented all the Yugoslav people. The People's Front coalition, headed by the Communist Party of Yugoslavia and its general secretary Marshal Josip Broz Tito, was a major movement within the government. Other political movements that joined the government included the "Napred" movement represented by Milivoje Marković. Yugoslavia was now once more a fully intact state, and was envisioned by the Partisans as a "Democratic Federation", including six federal states: the Federal State of Bosnia and Herzegovina (FS Bosnia and Herzegovina), Federal State of Croatia (FS Croatia), Federal State of Macedonia (FS Macedonia), Federal State of Montenegro (FS Montenegro), Federal State of Serbia (FS Serbia), and Federal State of Slovenia (FS Slovenia). The nature of its government, however, remained unclear, and Tito was highly reluctant to include the exiled King Peter II in post-war Yugoslavia as demanded by Winston Churchill. In February 1945, Tito acknowledged the existence of a Regency Council representing the King: the first and only act of the council as established on 7 March, however, was to proclaim a new government under Tito's premiership. The nature of the state was still unclear immediately after the war, and on 26 June 1945, the government signed the United Nations Charter using only Yugoslavia as an official name, with no reference to either a Kingdom or a Republic. Acting as head of state on 7 March, the King appointed to his Regency Council constitutional lawyers Srđan Budisavljević, Ante Mandić and Dušan Sernec. In doing so, the King empowered his Council to form a common temporary government with NKOJ and accept Tito's nomination as Prime Minister of the first normal government. As authorized by the King, the Regency Council has thus accepted the Tito's nomination on 29 November 1945 when FNRY was declared. By this unconditional transfer of powers, King Peter II has abdicated to Tito. This date, when the second Yugoslavia was born under international law, had since been marked as Yugoslavia's national holiday Day of the Republic, however following the communists' switch to totalitarianism, this holiday officially marked the 1943 Session of AVNOJ that coincidentally fell on the same day of the year. On 29 November 1945, the second anniversary of the Second Session of the AVNOJ, the Constituent Assembly of Yugoslavia formally abolished the monarchy and declared the state a republic. The country's official name became the Federal People's Republic of Yugoslavia (FPR Yugoslavia, FPRY), and the six "Federal States" became "People's Republics" Yugoslavia became a single-party state and was considered in its earliest years a model of communist orthodoxy. The Yugoslav government allied with the Soviet Union under Free Territory of Trieste was established, and separated into Zone A and Zone B, administered by the western Allies and Yugoslavia respectively. Initially, Yugoslavia was backed by Stalin, but by 1947 the latter had begun to cool towards the new state's ambitions. The crisis eventually dissolved as the Tito–Stalin split started, with Zone A being granted to Italy, and Zone B to Yugoslavia. Next came an exchange of letters directly between the Milovan Đilas, Aleksandar Ranković, Boris Kidrič, and Svetozar Vukmanović-Tempo) inviting Tito to purge them, and thus cause a rift in his own party. Communist officials Andrija Hebrang and Sreten Žujović supported the Soviet view. 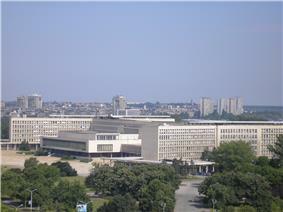 Yugoslavia began a number of fundamental reforms beginning in the early 1950s, bringing about change in three major directions: rapid liberalization and decentralization of the country's political system, the institution of a new, unique economic system, and a diplomatic policy of non-alignment. 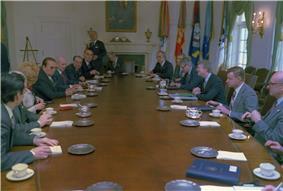 Yugoslavia refused to take part in the communist Warsaw Pact and instead took a neutral stance in the Cold War and became a founding member of the Non-Aligned Movement along with countries like India, Egypt and Indonesia, and pursued one of its center-left influences that promoted a non-confrontational policy towards the U.S. The country distanced itself from the Soviets in 1948 and started to build its own way to socialism under the strong political leadership of Josip Broz Tito, sometimes informally called "Titoism". The economic reforms began with the introduction of workers' self-management in June 1950. Essentially, in this system, profits were shared among the workers themselves as workers' councils controlled production and the profits. An industrial sector began to emerge thanks to the government's implementation of industrial and infrastructure development programs. Exports of industrial products, led by heavy machinery, transportation machines (esp. shipbuilding industry), and military technology and equipment, rose by a yearly increase of 11%. All in all, the annual growth of the gross domestic product (GDP) all through to the early 1980s averaged 6.1%. The result was a regime that was somewhat more humane than other Communist regimes in the Eastern Bloc. However, it wasn't a liberal one either. The LCY retained absolute power, with the legislature being little more than a rubber stamp. The secret police, the State Security Administration (UDBA), while operating with considerably more restraint than its counterparts in the rest of Eastern Europe, was nonetheless a feared tool of government control. UDBA was particularly notorious for assassinating suspected "enemies of the state" who lived in exile overseas. The media remained under restrictions that were somewhat onerous by Western standards, but still had somewhat more latitude than the media in other Communist countries. Nationalist groups were a particular target of the authorities, with numerous arrests and prison sentences handed down over the years for separatist activities. Many of the demands made in the 1971 Croatian Spring, such as giving more autonomy to the individual republics, became reality with the new federal constitution 1974. At the same time that the constitution gave the republics more autonomy it also awarded a similar status to two autonomous provinces within Serbia, Kosovo, a largely ethnic Albanian populated region, and Vojvodina, a region with Serb majority but large numbers of ethnic minorities, such as Hungarians. These reforms satisfied most of the republics, especially Croatia as well as the Albanians of Kosovo and the minorities of Vojvodina. But the 1974 constitution deeply aggravated Serbian communist officials and Serbs themselves who distrusted the motives of the proponents of the reforms. Many Serbs saw the reforms as concessions to Croatian and Albanian nationalists, as no similar autonomous provinces were made to represent the large numbers of Serbs of Croatia or Bosnia and Herzegovina and Serb nationalists were frustrated over Tito's support of the recognition of Montenegrins and Macedonians as independent nationalities, as Serbian nationalists had claimed that there was no ethnic or cultural difference separating these two nations from the Serbs that could verify that such nationalities truly existed. Ideology and particularly nationalism has been seen by many as the primary source of the breakup of Yugoslavia. Since the 1970s, Yugoslavia's Communist regime became severely splintered into a liberal-decentralist nationalist faction led by Croatia and Slovenia that supported a decentralized federation to give greater autonomy to Croatia and Slovenia, versus a conservative-centralist nationalist faction led by Serbia that supported a centralized federation to secure Serbia's and Serbs' interests across Yugoslavia – as they were the largest ethnic group in the country as a whole. From 1967 to 1972 in Croatia and 1968 and 1981 protests in Kosovo, nationalist doctrines and actions caused ethnic tensions that destabilized the country. The suppression by the Communist regime of nationalists is believed to have had the effect of identifying nationalism as the primary alternative to communism itself and made it a strong underground movement. In the late 1980s, the Belgrade elite was faced with a strong opposition force of massive protests by Kosovo Serbs and Montenegrins as well as public demands for political reforms by the critical intelligentsia of Serbia and Slovenia. In economics, since the late 1970s a widening gap of economic resources between the developed and underdeveloped regions of Yugoslavia severely deteriorated the federation's unity. The most developed republics, Croatia and Slovenia, rejected attempts to limit their autonomy as provided in the 1974 Constitution. Public opinion in Slovenia in 1987 saw better economic opportunity in independence from Yugoslavia than within it. There were also places that saw no economic benefit from being in Yugoslavia; for example, the autonomous province of Kosovo was poorly developed, and per capita GDP fell from 47 percent of the Yugoslav average in the immediate post-war period to 27 percent by the 1980s. 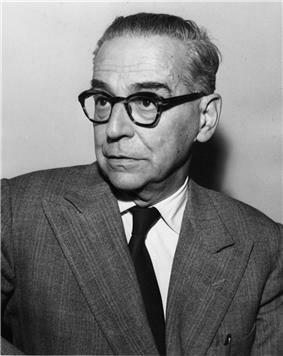 However economic issues have not been demonstrated to be the sole determining factor in the breakup of Yugoslavia, as Yugoslavia in this period was the most prosperous Communist state in Eastern Europe at this time period and the country in fact disintegrated during a period of economic recovery after the implementation of the economic reforms of Ante Marković's government. Furthermore, during the breakup of Yugoslavia, the leaders of Croatia, Serbia, Slovenia, all declined an unofficial offer by the European Community to provide substantial economic support to them in exchange for a political compromise. However the issue of economic inequality between the republics, autonomous provinces, and nations of Yugoslavia resulted in tensions with claims of disadvantage and accusations of privileges against others by these groups. Political protests in Serbia and Slovenia, which later developed into ethnic-driven conflict, began in the late 1980s as protests against the alleged injustice and bureaucratization of the political elite. Members of the political elite managed to redirect these protests against "others". Serb demonstrators were worried about the disintegration of the country and alleged that "the others" (Croats, Slovenes, and international institutions) were deemed responsible. The Slovene intellectual elite argued that "the others" (Serbs) were responsible for Greater Serbian expansionist designs, for economic exploitation of Slovenia, and for the suppression of Slovene national identity. These redirection actions of the popular protests allowed the regimes in Serbia and Slovenia to survive at the cost of undermining the unity of Yugoslavia. Other republics such as Bosnia & Herzegovina and Croatia refused to follow these tactics taken by Serbia and Slovenia, later resulting in the defeat of these Communist regimes to nationalist political forces. From the point of view of international politics, it has been argued that the end of the Cold War contributed to the breakup of Yugoslavia because Yugoslavia lost its strategic international political importance as an intermediary between the Eastern and Western blocs. As a consequence, Yugoslavia lost the economic and political support provided by the West, and increased pressure from the International Monetary Fund (IMF) to reform its institutions made it impossible for the Yugoslav reformist elite to respond to rising social disorder. The collapse of communism throughout Eastern Europe and the Soviet Union undermined the country's ideological basis and encouraged anti-communist and nationalist forces in the Western-oriented republics of Croatia and Slovenia to increase their demands. Nationalist sentiment among ethnic Serbs rose dramatically following the ratification of the 1974 Constitution, which reduced the powers of SR Serbia over its autonomous provinces of SAP Kosovo and SAP Vojvodina. In Serbia, this caused increasing xenophobia against Albanians. In Kosovo (administered mostly by ethnic Albanian communists), the Serbian minority increasingly put forth complaints of mistreatment and abuse by the Albanian majority. 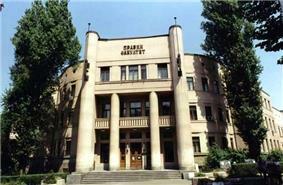 Feelings were further inflamed in 1986, when the Serbian Academy of Sciences and Arts (SANU) published the SANU Memorandum. In it, Serbian writers and historians voiced "various currents of Serb nationalist resentment. The League of Communists of Yugoslavia (SKJ) was at the time united in condemning the memorandum, and resumed following its anti-nationalist policy. 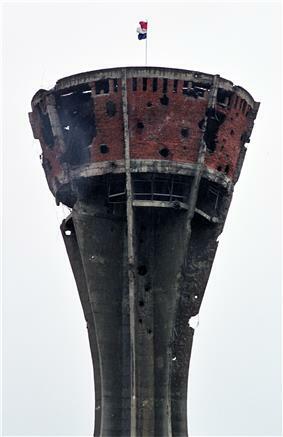 Vukovar water tower during the Siege of Vukovar. The tower came to symbolize the town's resistance to Serb forces. Fed up by Milošević's manipulation of the assembly, the delegations of the League of Communists of Croatia, led by Ivica Račan, and the League of Communists of Slovenia both walked-out during the extraordinary 14th Congress of the League of Communists of Yugoslavia (January 1990), effectively dissolving the all-Yugoslav party. This in turn, along with external pressure, caused the adoption of multi-party systems in all republics. When the individual republics organized their multi-party elections in 1990, the ex-communists mostly failed to win re-election. In Croatia and Slovenia, nationalist parties won their respective elections. In Croatia, the SAO Krajina, which demanded to remain in union with the rest of the Serb populations if Croatia decided to secede. The government of Serbia endorsed the Croatian Serbs' rebellion, claiming that for Serbs, rule under Tuđman's government would be equivalent to the World War II fascist Independent State of Croatia (NDH) which committed genocide against Serbs during World War II. Milošević used this to rally Serbs against the Croatian government and Serbian newspapers joined in the warmongering. Serbia had by now printed $1.8 billion worth of new money without any backing of Yugoslav central bank. The personnel manning the border posts were, in most cases, already Slovenians, so the Slovenian take-over mostly simply amounted to changing of uniforms and insignia, without any fighting. By taking control of the borders, the Slovenians were able to establish defensive positions against an expected YPA attack. This meant that the YPA would have to fire the first shot. It was fired on 27 June at 14:30 in Divača by an officer of YPA. 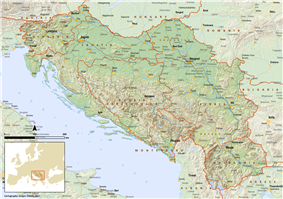 After the secession of Bosnia and Herzegovina, Yugoslavia was considered completely dissolved into five successor states: Bosnia and Herzegovina, Croatia, Macedonia, Slovenia and FR Yugoslavia (later renamed "Serbia and Montenegro"). ^ a b John Hladczuk (1 January 1992). International Handbook of Reading Education. Greenwood Publishing Group. pp. 454–. ^ "Ustav Socijalističke Republike Hrvatske (1974), Član 138" [Constitution of the Socialist Republic of Croatia (1974), Article 138] (PDF) (in Croatian). ^ Murphy, Sean D. (2002). United States Practice in International Law: 1999-2001, Volume 1. Cambridge University Press. p. 130. ^ a b c d Rose, Arnold M. (1999). Institutions of Advanced Societies. University of Minnesota Press. ^ Stevan K. Pavlowitch (January 2002). Serbia: The History Behind the Name. C. Hurst & Co. Publishers. p. 164. ^ "European Commission - Enlargement - Candidate and Potential Candidate Countries". Europa web portal. Retrieved 1 August 2009. The successor states of Yugoslavia continue to have a population growth rate that is close to zero or negative. This is mostly due to emigration, which intensified during and after the Yugoslav Wars, during the 1990s to 2000s. More than 2.5 million refugees were created by the fighting in Bosnia and Kosovo, which led to a massive surge in North American immigration. Close to 120,000 refugees from the former Yugoslavia were registered in the United States from 1991 to 2002, and 67,000 migrants from the former Yugoslavia were registered in Canada between 1991 and 2001. All of the successor states are candidates for European Union membership, with Slovenia and Croatia already having joined. Slovenia joined in 2004, and Croatia followed in 2013. Macedonia, Montenegro and Serbia are official candidates, while Bosnia and Herzegovina and Kosovo have not submitted an application but are nevertheless recognized as "potential candidates" for a possible future enlargement of the European Union. All states of the former Yugoslavia, with the exception of Kosovo, have subscribed to the Stabilisation and Association Process with the EU. EULEX (European Union Rule of Law Mission in Kosovo) is a deployment of EU police and civilian resources to Kosovo in an attempt to restore rule of law and combat the widespread organized crime. They are also sometimes referred to as the "Yugosphere", or shortened as Ex Yu, ExYu or Ex-Yu. Remembrance of the time of the joint state and its perceived positive attributes is referred to as Yugo-nostalgia (Jugonostalgija). People who identify with the former Yugoslav state may self-identify as Yugoslavs. Yugoslavia shared the melody of its national anthem with Poland. Its first lyrics were written in 1834 under the title "Hey, Slovaks" (Hej, Slováci) and it has since served as the anthem of the Pan-Slavic movement, the anthem of the Sokol physical education and political movement, and the anthem of the World War II Slovak Republic, Yugoslavia and Serbia and Montenegro. The song is also considered to be the second, unofficial anthem of the Slovaks. Its melody is based on Mazurek Dąbrowskiego, which has been also the anthem of Poland since 1926, but it is much slower and more accentuated. Tennis had always been a popular and well-followed sport in the country. Still, due to lack of financial means for tennis infrastructure and support of individual athletes, the participation rates among the Yugoslav youngsters for tennis were always low compared to other sports. All this meant that talented players determined to make it to pro level mostly had to rely on their own families rather than the country's tennis federation. Yugoslav players still managed to produce some notable results, mostly in the women's game. In 1977, the country got its first Grand Slam champion when clay court specialist Mima Jaušovec won at Roland Garros, beating Florența Mihai; Jaušovec reached two more French Open finals (in 1978 and 1983), but lost both of them. It was with the rise of teenage phenom Monica Seles (an ethnic Hungarian born in Novy Sad) during early 1990s that the country became a powerhouse in female tennis: she won five Grand slam events under the flag of SFR Yugoslavia — two French Opens, two Australian Opens, and one US Open. She went on to win three more Grand Slam titles under the flag of FR Yugoslavia (Serbia and Montenegro) as well as yet one more Grand Slam after immigration to the United States. Gymnast Miroslav Cerar won a number of accolades, including two Olympic gold medals during the early 1960s. On the women's side, the game also yielded some notable results - the women's team won Olympic gold in 1984 while it also won World Championship in 1973. Yugoslavia won two Olympic gold medals — 1972 in Munich (handball returned as an Olympic sport following a 36-year absence) and 1984 in Los Angeles. The country also won the World Championships title in 1986. SFR Yugoslavia never got to compete at the European Championship because the competition got established in 1994. And finally the team won only one European Championship tile, in 1991, after failing to do so for previous 40 years during which it always finished second or third. It also won two World Championship titles - in 1986 and 1991, the latter coming without Croatian players who by that time had already left the national team. Throughout the 1950s and early 1960s, the Yugoslav national team had always been a contender, but never quite managed to make the final step. It was in the 1968 Olympics that the generation led by Mirko Sandić and Ozren Bonačić finally got the gold, beating Soviet Union after extra time. The country won two more Olympic golds - in 1984 and 1988. Furthermore, at the club level, Yugoslav clubs won the European Champion's Cup, the continent's premiere basketball club competition, on seven different occasions - KK Bosna in 1979, KK Cibona in 1985 and 1986, Jugoplastika Split in 1989, 1990, and 1991, and KK Partizan in 1992. It didn't take long for the Yugoslav national team to become a contender on world stage. The country's most notable results were winning three FIBA Basketball World Cups (in 1970, 1978, and 1990), a gold medal at the 1980 Olympics in Moscow, in addition to five European Championships (three of them consecutively 1973, 1975, and 1977, followed by two more consecutive ones in 1989 and 1991). On the player front, Yugoslavia produced some notable performers on the world stage; such as Rajko Mitić, Stjepan Bobek, Bernard Vukas, Vladimir Beara, Dragoslav Šekularac, Milan Galić, Josip Skoblar, Ivan Ćurković, Velibor Vasović, Dragan Džajić, Safet Sušić, Dragan Stojković, Dejan Savićević, Darko Pančev, Robert Prosinečki, etc. In the youth category, Yugoslavia under-20 team qualified for just two FIFA U-20 World Cups (back then known as FIFA World Youth Championship), but famously won in 1987 in Chile while the Yugoslav under-21 team qualified for four UEFA European Under-21 Football Championships winning the inaugural edition in 1978 and coming runners-up in 1990. Additionally, the Yugoslav Olympic team (under-23) won gold at the 1960 Olympics in Rome after previously getting three silvers consecutively - 1948 in London, 1952 in Helsinki, and 1956 in Melbourne - as well as a bronze in 1984 in Los Angeles. The country also qualified for five European Championships, however it participated in only four because it got banned from taking part in the Euro '92 due to a UN embargo as a result of the Yugoslav Wars despite qualifying for the tournament. Best results came in 1960 and 1968 when on both occasions the final was reached and both times the team lost - in 1960 to Soviet Union and in 1968 to Italy. The country's biggest footballing achievement came on the club level with Red Star Belgrade winning the 1990–91 European Cup, beating Olympique de Marseille in the final played in Bari on 29 May 1991. Later that year, they would become world club champions by beating Colo-Colo 3-0 in the Intercontinental Cup in Tokyo. SFR Yugoslavia was the only communist country which was taking part in the Eurovision Song Contest, starting in 1961, even before some Western nations, with the group Riva winning the contest in 1989. The Film, Galija, Haustor, Idoli, Indexi, Korni Grupa, KUD Idijoti, Laboratorija Zvuka, Lačni Franz, Laibach, Leb i Sol, Josipa Lisac, Pankrti, Paraf, Parni Valjak, Partibrejkers, Pekinška Patka, Plavi Orkestar, Prljavo Kazalište, Psihomodo Pop, Riblja Čorba, September, Smak, Šarlo Akrobata, Time, YU Grupa, Zabranjeno Pušenje, and others. 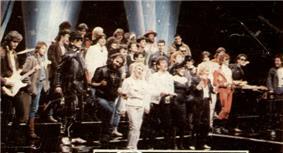 As a member of the Non-Aligned Movement, Yugoslavia was far more opened to the Western culture comparing to other socialist countries, and the western-influenced popular music was socially accepted and well covered in the media, which included numerous music magazines, radio and TV shows. A very popular genre in Yugoslavia, also exported to other neighboring countries, and also popular among the Yugoslav emigration world-wide, was the Narodna muzika. The folk music emerged in force during the 1970s and 1980s, and by the 1980s and 1990s the so-called novokomponovana muzika style appeared and gave place to controversial turbo-folk style. Lepa Brena in the 1980s become the most popular singer of the Yugoslavia, and a top-selling female recording artist with more than 40 million records sold. Folk performers enjoyed great popularity and became constant presence in the tabloids and media. Prominent traditional music artists were the award winning Tanec ensemble, the Gypsy music performer Esma Redžepova and others. The Yugoslav cinema featured notable actors Danilo Stojković, Ljuba Tadić, Fabijan Šovagović, Mustafa Nadarević, Bata Živojinović, Boris Dvornik, Ljubiša Samardžić, Dragan Nikolić, Pavle Vujisić, Mira Banjac, Stevo Žigon, Voja Brajović, Miki Manojlović, Svetlana Bojković, Miodrag Petrović Čkalja, Zoran Radmilović, Josif Tatić, Milan Gutović, Milena Dravić, Bekim Fehmiu, Neda Arnerić, Rade Šerbedžija, Mira Furlan, Ena Begović and others. Film directors included: Emir Kusturica, Dušan Makavejev, Goran Marković, Lordan Zafranović, Goran Paskaljević, Živojin Pavlović and Hajrudin Krvavac. Many Yugoslav films featured eminent foreign actors such as Orson Welles, Sergei Bondarchuk, Franco Nero and Yul Brynner in the Academy Award nominated The Battle of Neretva, and Richard Burton in Sutjeska. Also, many foreign films were shot on locations in Yugoslavia including domestic crews, such as Force 10 from Navarone, Armour of God, as well as Escape from Sobibor. Prior to the collapse of Yugoslavia in the 1990s, Yugoslavia had a multicultural society based on the concept of brotherhood and unity and the memory of the communist Yugoslav Partisans' victory against fascists and nationalists as the rebirth of the Yugoslav people. In the SFRY the history of Yugoslavia during World War II was portrayed as a struggle not only between Yugoslavia and the Axis Powers, but as a struggle between good and evil within Yugoslavia with the multiethnic Yugoslav Partisans were represented as the "good" Yugoslavs fighting against manipulated "evil" Yugoslavs – the Croatian Ustaše and Serbian Chetniks. The SFRY was presented to its people as the leader of the non-aligned movement and that the SFRY was dedicated to creating a just, harmonious, Marxist world. Artists from different ethnicities in the country were popular amongst other ethnicities, and the film industry in Yugoslavia avoided nationalist overtones until the 1990s. The University of Zagreb (founded 1669) and University of Belgrade (founded 1808) already existed before the creation of Yugoslavia. As Yugoslavia splintered, the army factionalized along cultural lines, by 1991 and 1992, Serbs made up almost the entire army as the separating states formed their own. The regular army mostly originated from the Yugoslav Partisans and the People's Liberation Army of the Yugoslav People's Liberation War in the Second World War. Yugoslavia also had a thriving arms industry and sold to such nations as Kuwait, Iraq, and Burma, amongst many others (including a number of staunchly anti-Communist regimes like Guatemala). Yugoslav companies like Zastava Arms produced Soviet-designed weaponry under license as well as creating weaponry from scratch, ranging from police pistols to airplanes. SOKO was an example of a successful military aircraft design by Yugoslavia before the Yugoslav wars. The Yugoslav People's Army or JNA/JLA was the main organization of the military forces. It was composed of the ground army, navy and aviation. Most of its military equipment and pieces were domestically produced. 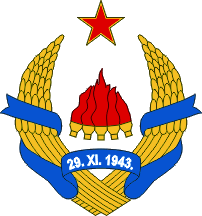 The armed forces of Socialist Federal Republic of Yugoslavia consists of the Yugoslav People's Army (JNA), Territorial Defense (TO), Civil Defense (CZ) and Milicija (police) in war time. Socialist Yugoslavia maintained a strong military force. Two alphabets used in Yugoslavia were: the Latin alphabet and the Cyrillic script. Both alphabets were modified for use by the Serbo-Croatian language in the 19th century, thus the Serbo-Croatian Latin alphabet is more closely known as Gaj's Latin alphabet, while Cyrillic is referred to as the Serbian Cyrillic alphabet. Serbo-Croatian uses both alphabets, Slovene uses only the Latin alphabet, and Macedonian uses only the Cyrillic alphabet. It should be noted that the Croatian variant of the language used exclusively Latin, while the Serbian variant used both Latin and Cyrillic. Three main languages all belong to the South Slavic language group and are thus similar, allowing most people from different areas to understand each other. Intellectuals were mostly acquainted with all three languages, while people of more modest means from SR Slovenia and SR Macedonia were provided an opportunity to learn the Serbo-Croatian language during the compulsory service in the federal military. Serbo-Croatian itself is made-up of three dialects, Shtokavian, Kajkavian, and Chakavian, with Shtokavian used as the standard official dialect of the language. Official Serbo-Croatian (Shtokavian), was divided into two similar variants, the Croatian (Western) variant and Serbian (Eastern) variant, with minor differences telling the two apart. The population of Yugoslavia spoke mainly three languages: Serbo-Croatian, Slovene and Macedonian. The Serbo-Croatian language was spoken by the populations in the federal republics of SR Serbia, SR Croatia, SR Bosnia and Herzegovina, and SR Montenegro – a total of 12,390,000 people by the late 1980s. Slovene was spoken by approximately 1,400,000 inhabitants of SR Slovenia, while Macedonian was spoken by 1,210,000 inhabitants of SR Macedonia. National minorities used their own languages as well, with 506,000 speaking Hungarian (primarily in a part of SAP Vojvodina), and 2,000,000 persons speaking Albanian in SR Serbia (Kosovo and Presevo Valley), SR Macedonia and SR Montenegro. Turkish, Romanian, and Italian were also spoken to a lesser extent. Because of the political reasons the Albanian language used as official in Yugoslavia was actually the unified literary language of Albania predominantly based on Tosk Albanian although Yugoslav Albanians were Ghegs. The SFRY recognised "nations" (narodi) and "nationalities" (narodnosti) separately; the former included the constituent Slavic peoples, while the latter included other Slavic and non-Slavic ethnic groups such as Bulgarians and Slovaks (Slavic); and Hungarians and Albanians (non-Slavic). About a total of 26 known sizeable ethnic groups were known to live in Yugoslavia, including the Romani people. In 1992, the SFRY's territory disintegrated as the independent states of Slovenia, Croatia, Macedonia and Bosnia and Herzegovina separated from it, though the Yugoslav military controlled parts of Croatia and Bosnia prior to the state's dissolution. By 1992, only the republics of Serbia and Montenegro remained committed to union, and formed the Federal Republic of Yugoslavia (FRY) in that year. The most significant change to the borders of the SFRY occurred in 1954, when the adjacent Free Territory of Trieste was dissolved by the Treaty of Osimo. The Yugoslav Zone B, which covered 515.5 km², became part of the SFRY. Zone B was already occupied by the Yugoslav National Army. In the Kingdom of Yugoslavia, there were also the Opatija tram and trams in Pula. The Belgrade Metro plans started during the time of SFR Yugoslavia. Transport infrastructure built or significantly expanded during the existence of SFR Yugoslavia included the Brotherhood and Unity Highway, the electrified Zagreb-Belgrade railway, and the Belgrade–Bar railway. In the 1970s, the economy was reorganized according to enterprises, so that these continued to compete to an extent, even when they were part of a same composite organization. In practice, the appointment of managers and the strategic policies of composite organizations were, depending on their size and importance, often subject to political and personal influence-peddling. Despite their common origins, the economy of socialist Yugoslavia was much different from the economies of the Soviet Union and other Eastern European communist countries, especially after the Yugoslav-Soviet break-up of 1948. Though ultimately owned by the state, Yugoslav companies were collectively managed by the employees themselves, much like in the Israeli kibbutz and the anarchist industrial cooperatives of Revolutionary Catalonia. The occupation and liberation struggle in World War II left Yugoslavia's infrastructure devastated. Even the most developed parts of the country were largely rural, and the little industry the country had was largely damaged or destroyed. 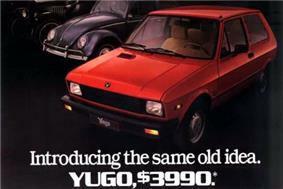 Billboard poster for US sales of the Yugo automobile of the Zastava automobile company. Yugoslavia had mixed relations with the communist regime of Enver Hoxha of Albania. Initially Yugoslav-Albanian relations were forthcoming, as Albania adopted a common market with Yugoslavia and required the teaching of Serbo-Croatian to students in high schools. At this time, the concept of creating a Balkan Federation was being discussed between Yugoslavia, Albania, and Bulgaria. Albania at this time was heavily dependent on economic support of Yugoslavia to fund its initially weak infrastructure. Trouble between Yugoslavia and Albania began when Albanians began to complain that Yugoslavia was paying too little for Albania's natural resources. Afterward, relations between Yugoslavia and Albania worsened. From 1948 onward, the Soviet Union backed Albania in opposition to Yugoslavia. On the issue of Albanian-dominated Kosovo, Yugoslavia and Albania both attempted to neutralize the threat of nationalist conflict, Hoxha opposed nationalist sentiment in Albania as he officially believed in the communist ideal of international brotherhood of all people, though on a few occasions in the 1980s, Hoxha did make inflammatory speeches in support of Albanians in Kosovo against the Yugoslav government, when public sentiment in Albania was firmly in support of Kosovo Albanians. In 1968, Tito offered Czechoslovak leader Alexander Dubček that he would fly to Prague on three hours notice if Dubček needed help in facing down the Soviet Union which was occupying Czechoslovakia at the time. In the same year Tito became active in promoting a peaceful resolution of the Arab-Israeli conflict. His plan called for Arab countries to recognize the State of Israel in exchange for Israel returning territories it had gained. The Arab countries rejected his land for peace concept. However, that same year, Yugoslavia no longer recognizes Israel. On 1 January 1967, Yugoslavia was the first communist country to open its borders to all foreign visitors and abolish visa requirements. Under Tito, Yugoslavia adopted a policy of neutrality in the Cold War. It developed close relations with developing countries (see Non-Aligned Movement) as well as maintaining cordial relations with the United States and Western European countries. Stalin considered Tito a traitor and openly offered condemnation towards him. In 1968, following the occupation of Czechoslovakia by the Soviet Union, Tito added an additional defense line to Yugoslavia's borders with the Warsaw Pact countries. Yugo-nostalgia and ideas of reunification are still popular topics among the citizens of foreign Yugoslav republics, even though officially reunion hasn't been proposed yet.